I love the Christmas Baubles!! So pretty!! 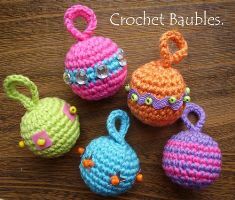 I've been looking for some small, simple ornaments I could crochet for my tree - I'm having a Homemade Christmas this year and making crochet scarves for all my females family members & friends and making Amigurumi animals for babies and puppies. My kids and I have done a few cute candy canes for the tree, but these look exactly like what I've been looking for! Hermosos , te quedaron !! Besos y gracias por el tutorial! Qué bonitoooos y divertidos me encantan. Olá! adorei, estou seguindo e acompanhando o seu blog que por sinal é muito legal e interessante.